The beautiful scenery of ripe apples and pumpkins and nature’s dramatic combination of red, orange and yellow colors make wedding photographs during Fall Season as breathtaking as those taken during summer. If you choose your location well, it may be less hot and you could have a wedding that is sweat-free. This would also mean you and your entourage could have more options for gowns and suits. Since the scenery and the weather (less likely to rain) are more in your favor, you can choose spectacular decorations for your wedding ceremony and wedding reception. There are also a lot of ideas to choose from such as rustic fall wedding theme, harvest (apple or pumpkin dominated decors) theme and barn wedding among others. With many things going about during autumn, having a fall wedding can make you explore more ideas for wedding favors, bouquets, foods and little things like guest-sign in table and place card holders. This could even cost you with reasonable prices since they are in season. You can even have cool ideas like crystal wedding trees, acorn wreaths, firefly jars which are unique fall wedding ideas you can apply. When planning for your wedding, check out with your wedding planner or with your hubby so you can find the best season for you. 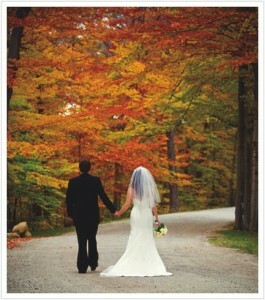 Who knows, you’ll be falling in love with a Fall Wedding.